I’m currently working on a pretty exciting project – designing an online course to help UEA students develop and reflect on their digital literacies in three overlapping contexts: the personal, the academic, and the workplace. Me being me, of course I have talked a lot from the start about the complex nature of digital practices and identities, and the dangers of viewing DLs through a purely functional lens or of reducing it to a simplistic ‘skills’ discourse. From the outset, however, the project board has been clear that the course shouldn’t be a didactic, ‘death by Blackboard’ experience for participants but a genuinely active one: rather than reading about digital literacies (or watching videos about it – digital but still didactic) they should be involved in creating digital artefacts themselves all the way through, and critically (and contextually) appraising those made by others. What does a ‘digital student’ look like, and does the answer vary according to discipline or context? UEA’s Information Services Directorate is in the process of designing an online course on Digital Literacies for UEA students in partnership with Careers and with the support of Dean of Students’ Office. Despite being a somewhat elusive concept, the need for digital literacy among students, graduates and citizens generally is gaining recognition in higher education across the UK and beyond. Digital literacy has been identified as a UEA graduate attribute, and is a component in the UEA Skills Award. But what exactly is (or are) digital literacy (or literacies)? How are they different from IT skills? And what do they look like in an academic context? Despite its persistence, the ‘digital natives/digital immigrants’ theory put forward by Prensky in 2001 has been challenged repeatedly in research literature (see e.g. White & Le Cornu, 2011; Bennett et al, 2008). Although the idea that those born after a certain year (usually given as 1980) possess an innate and sophisticated understanding of digital technologies seems anecdotally appealing, this belief is not borne out by the evidence (see, for instance, Margaryan et al., 2011, and the larger-scale study by Kennedy et al., 2008, both of which suggest that university students use a limited range of mainly established digital technologies). Most importantly, the essentialist nature of the digital native concept masks the fact that young people’s fluency with technology and digital environments may not extend into critical, ethical or reflective judgements about online information or the behaviours and practices relating to using, creating or interacting with it. This is a dimension of digital literacy that lies beyond functional ICT skills, the capacity to download and use an app, or the ease of adaptation to a new device. “Human judgment, or criticality, is involved in most understandings of digital literacies” (Gillen & Barton, 2010, p.5), and it follows that a means of supporting the development of our students’ digital critical capabilities, as distinct from their ICT skills, is needed. This is not only about helping to make our students employable graduates: it’s also a crucial part of supporting their transition into the academic arena and its idiosyncratic uses of information and evidence; and perhaps most crucially, a vital part of what makes an individual an articulate, empowered and judicious member of society. ISD is piloting a four-unit online course to help UEA students reflect on and expand their existing digital skills and behaviours. The course will invite them to consider and share how they could deploy these skills in their own academic context as well as in preparing for future employability. The focus throughout is on promoting participants’ awareness of online issues, practices and choices as well as tools and apps. Running on Blackboard and aligned with the UEA Award, through which we hope the course will be validated, the programme will require participants to create artefacts using a variety of tools and to think about the ethical and practical implications of using, making and sharing material. One unit will focus on digital practices in the academic context, and another on employability issues. Although the course will be chiefly online we plan to offer a scheduled run (which will also be our pilot test) in November 2015, enabling us to give the programme a MOOC-like feel which we hope will encourage participants to develop a peer support network through the activities and discussion forums. 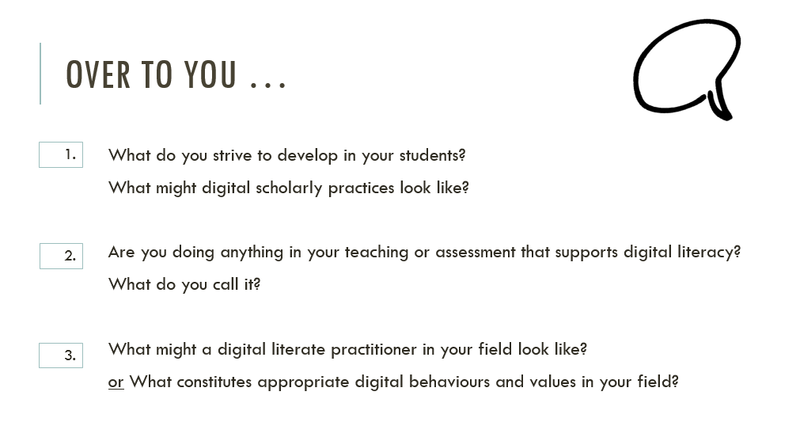 At the 2015 Learning and Teaching Day Jane Helgesen and Emma Coonan presented an overview of the proposed Digital Scholar course, and also attempted to gain some insights into academic views and practices of ‘digitalness’. We were especially interested in how digital aspects have permeated academic practices, and in turn how these are reflected to students in course and assessment design and in the discipline-specific behaviours enacted by academics. To this end, our audience kindly participated in a workshop where they shared their perceptions and expectations of ‘digitalness’ in the academic arena. The responses from workshop participants highlighted a variety of important aspects ranging from awareness of one’s online presence, through the need to filter and evaluate information critically, to understanding the ethical and contextual nature of using it. There were some interesting responses around appropriate online behaviour, including the need to “Develop a sense of responsibility” and for students to be “accountable for their actions”. One group noted that health professionals in particular “need to be aware of what they put on the internet”, highlighting the impact of the digital footprint in a professional as well as a personal context. Although dealing with the digital, these responses are very closely aligned with the academic emphasis on evidence-based, rigorous inquiry, for example the desire for students to “Challenge assumptions” and to “Think independently”. One group also pointed out that “Shortcuts/quick answers = surface learning” – a very relevant point in an era that resounds with internet-friendly soundbites. The issue of critical discernment in turn overlaps with an understanding of the contextual nature of how information is used in different environments. There is a strong ethical dimension within the workshop responses – copyright, legal responsibilities, citation and plagiarism were all mentioned. Alongside this was a desire for students to gain flexibility in their navigation of online environments – to recognise when they need to build their own skills, “understanding which area they need to develop”; to have “Confidence to experiment once acquired basic skills”, and the “Ability to use technology as a tool, not as an end in itself”. “Make informed choices about what they could do, how they could do it, and the relative merits of this choice in a particular digital context”. Jane and Emma are keen to gain more insight into how digital behaviours intersect with academic practices, and would be delighted to meet any staff member willing to talk about this intersection from the point of view of their own subject area. Our session at the Learning and Teaching Day elicited some ‘critical friends’ for the programme, but we would be very happy to gain more. We would be delighted to offer a closer look at the Digital Scholar programme content for anyone interested in exploring it further, either to assess how the course might support their students’ academic development or indeed to enhance their own digital literacies! Many thanks to all those who attended our parallel session and contributed valuable insights. Please do get in touch to tell us how the programme could support your students or have a look at our webpages: https://portal.uea.ac.uk/library/uea-digital-literacies. Bennett, S., Maton, K. & Kervin, L. (2008). 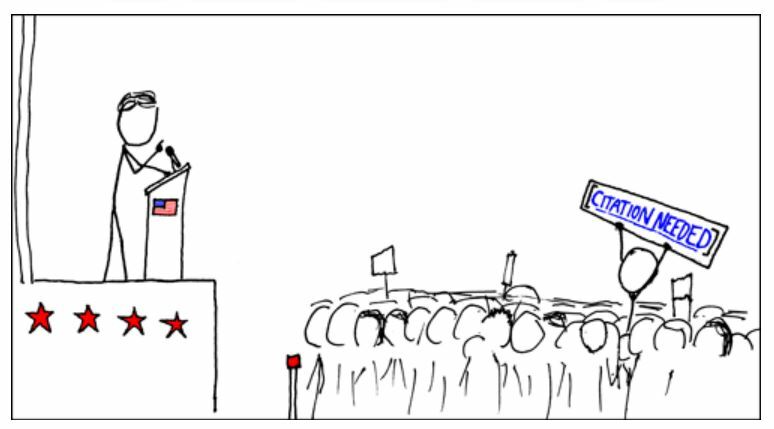 The ‘digital natives’ debate: a critical review of the evidence. British Journal of Educational Technology, 39(5), 775–786. doi:10.1111/j.1467-8535.2007.00793.x. Margaryan, A., Littlejohn, A. & Vojt, G. (2011). Are digital natives a myth or reality? University students’ use of digital technologies. Computers and Education, 56(2), 429–440. doi:10.1016/j.compedu.2010.09.004.